CAMERON POLLS DAY 6 | The Cameron Highlands by-election has entered the mid-point of the campaigning period. Former prime minister and former BN chairperson Najib Abdul Razak has a full-day schedule in Tanah Rata, with former education minister Mahdzir Khalid joining in during the afternoon. Meanwhile, Pakatan Harapan big guns are focusing on Jelai. DAP secretary-general Lim Guan Eng will continue his visits in Felda Sungai Koyan, while PKR president Anwar Ibrahim will arrive at night. Harapan’s mega ceramah is expected to start at 9pm tonight at Dataran Felda Koyan 1. Besides Anwar Ibrahim, Amanah vice-president Mujahid Yusof Rawa, deputy president Salahuddin Ayub and DAP deputy chairperson Gobind Singh Deo are among tonight’s scheduled speakers. Malaysiakini brings you live reports of the campaigning on the ground. Guan Eng: Why hasn't Pahang MB developed his constituency? 11.59pm - Thank you for following our live coverage of the sixty day of the campaigning period for the Cameron Highlands by-election. Reporting by Geraldine Tong, Ng Xiang Yi, Yasmin Ramlan and Annabelle Lee. If you like what we do, support independent media by joining our subscription programme for as low as RM0.41 a day. Details here. Don't forget to follow us on Facebook and Twitter for more news and views that matter. 10.45pm: Sungai Koyan 1, Jelai - PKR president Anwar Ibrahim, the main draw of the night, rallies support for Harapan candidate M Manogaran. “He has worked here for many years,” he says about the DAP man. Anwar also commends both Agriculture and Agro-based Industry Minister Salahuddin Ayub and Media and Communications Minister Gobind Singh Deo for playing by election rules and not announcing any allocations during the campaign period. “Our politics has changed, this is politics in the reformasi era. “Ministers can’t abuse their power and announce allocations during the campaign,” he tells a crowd of about 200 in the Felda settlement. 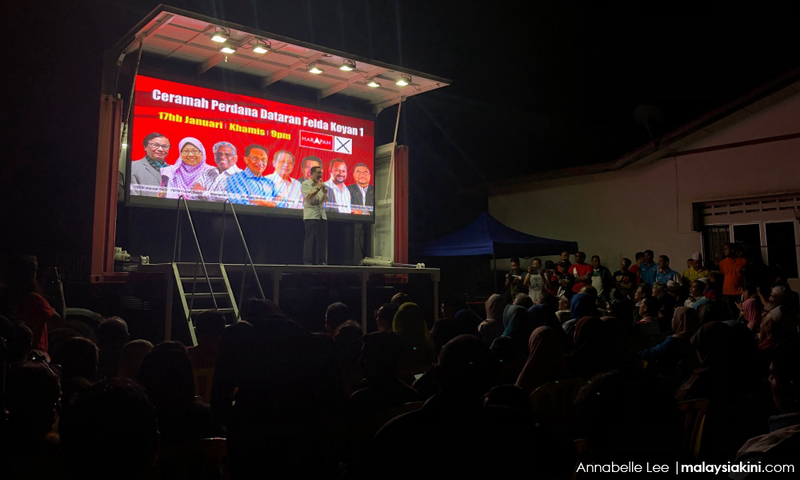 10pm: Sungai Koyan 1, Jelai - DAP secretary general Lim Guan Eng touts Harapan candidate M Manogaran’s ability to seek development for Sungai Koyan folk from federal ministers should he win. “But if BN wins, whose door is he going to knock on? “Unless he knocks on Jho Low’s door? If he can find him lah,” he says to laughter from the audience. Jho Low refers to 1MDB mastermind and fugitive businessperson Low Taek Jho. Lim, who is also the finance minister, also highlights that BN-held Pahang is the state with the highest debt, owing the federal government RM3.1 billion. “How will they bring development to Sungai Koyan and Jelai then?” he asks. 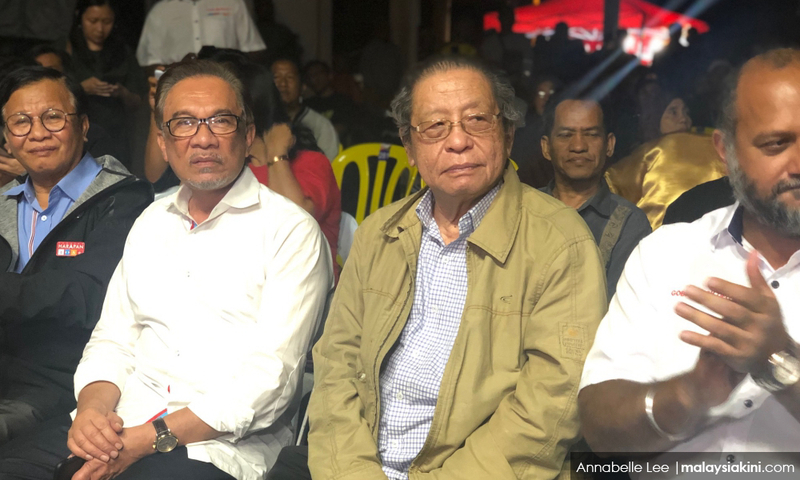 Earlier, top Harapan leaders such as Amanah vice-president Mujahid Yusof Rawa and DAP advisor Lim Kit Siang canvassed for Manogaran in the Malay majority area. 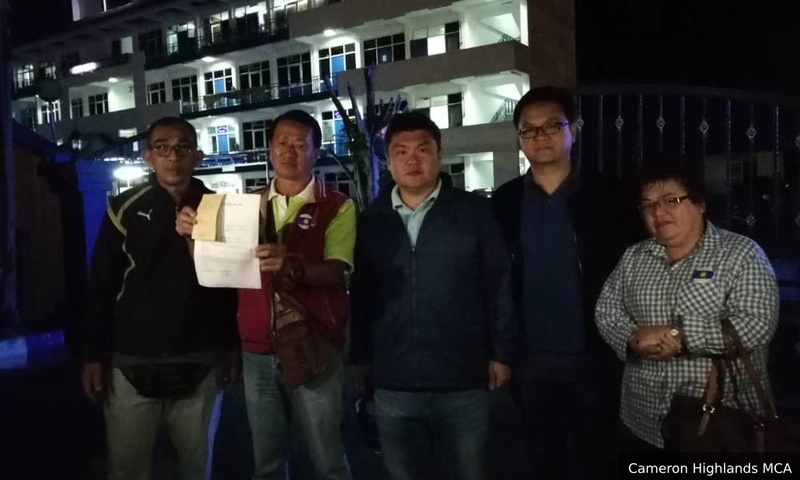 10pm: Brinchang - MCA Cameron Highlands lodges a police report at the Cameron Highlands district police headquarter after discovering that their voluntary medical check-up tent in Bertam Valley had been vandalised. 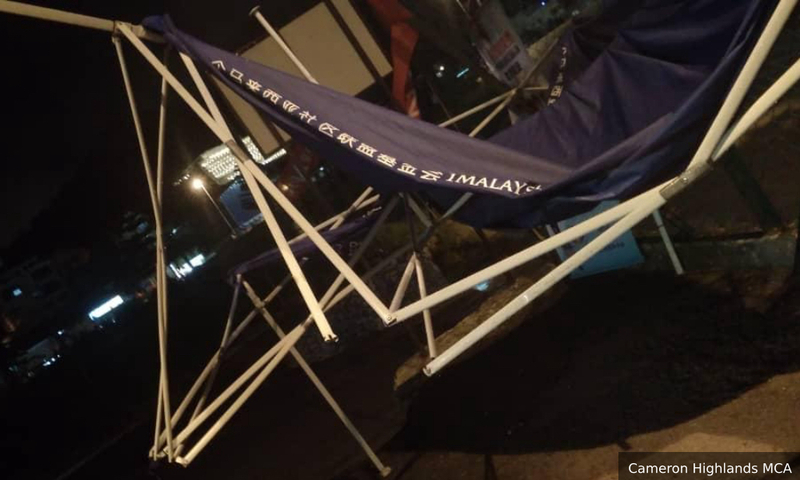 According to MCA, the tent was set up at Bertam Valley wet market this morning but it was found out the tent had tattered and collapsed in the evening, leading them to believe that unscrupulous individuals had destroyed the structure. MCA denounced the action and urged for a clean and fair election. 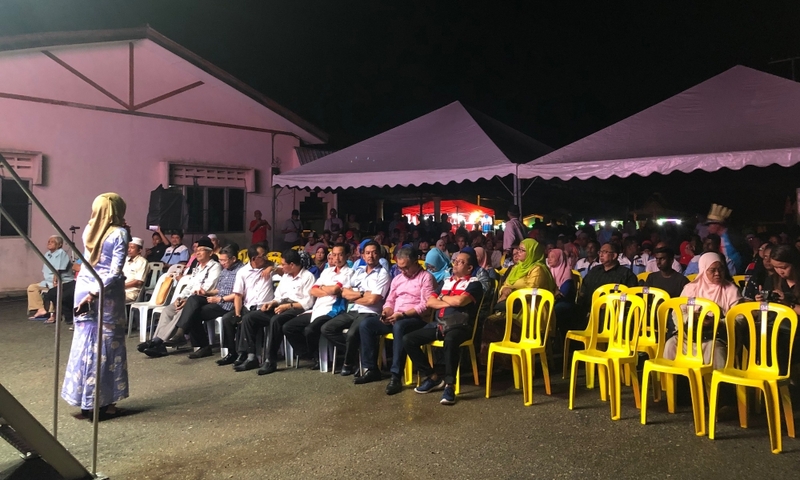 9.30pm: Sungai Koyan 1, Jelai - Pakatan Harapan’s major ceramah is getting off to a sluggish start with many empty chairs. 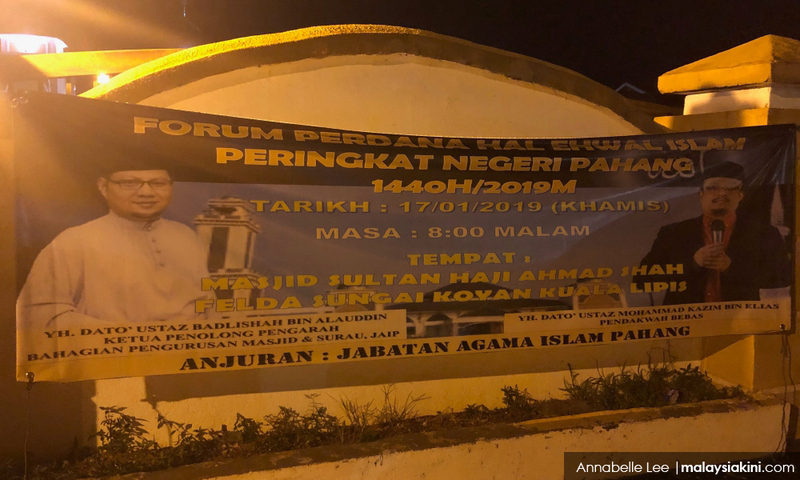 In contrary, just less than a five-minute walk away, it is a full house at the Al-Muhajirin mosque, where a state-level 'ceramah perdana' is being held, featuring Pahang state religious department (Jaip) deputy director Badlishah Alauddin and popular preacher Mohammad Kazim Elias. As Harapan top guns such as DAP veteran Lim Kit Siang speak, the ceramah at mosque can be heard via its loudspeakers. 3.56pm: Political parties contesting in the Cameron Highlands parliamentary by-election are to refrain from putting up campaign materials at Tenaga Nasional Berhad (TNB) premises or electrical installations, TNB says. According to Bernama, TNB warns that such acts are dangerous and could also prevent TNB personnel from accessing maintenance and restoring supply. “The prohibition includes pasting or suspending campaign materials such as posters, flags and banners on transmission towers, electric poles, cables, substations, concrete electric poles and overhead power lines. “People are also advised not to hold, carry or install flagpoles under any electrical transmission lines as electric shocks could occur," TNB reportedly says in a statement. 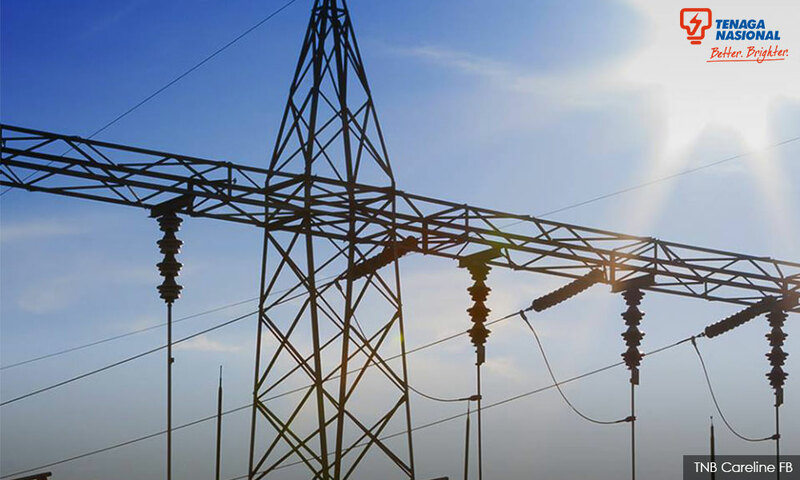 The company added that those caught could be fined under Section 37 of the Electricity Supply Act 1990 (Act 447), if convicted. 3pm: Sungai Koyan Police Station - Police confirm they have conducted preliminary investigations into alleged abuse of state resources by BN and the report has since been forwarded to the Election Commission (EC). Inspector Abdul Azim Abdul Manip tells Malaysiakini that upon the investigating the case, a report was first submitted to the state public prosecutor's office. "[...]The public prosecutor's instruction if for the report to be referred to the EC," Abdul Azim says, when questioned on a police report lodged on Jan 14 on the matter. In the report, it was alleged that BN was misusing state and central government infrastructure during campaigning after the coalition flags were viewed affixed to a Village Development and Security Committees (JKKK) building in Sungai Koyan, while BN vehicles were allegedly seen entering and exiting the compound. Malaysiakini has sighted a copy of the report. 3pm - Bersih takes Finance Minister Lim Guan Eng to task over the latter's remarks yesterday calling on voters in Cameron Highlands to choose Pakatan Harapan if they want development. "Bersih is concerned that Lim's remarks, hinting that development would be withheld from Cameron Highlands, not only smacks of discrimination in local development against opposition constituencies but can also be considered as undue influence, an election offence under Section 9 of the Election Offences Act 1954. "Bersih urges Lim to either clarify or reiterate his remarks to Cameron Highlands' voters immediately - will Harapan as the federal government discriminate against the constituency if they did not vote in their candidate or will they truly usher in a 'breath of fresh air' into Malaysian politics by promising development to Cameron Highlands regardless of who wins?" the electoral watchdog says in a statement. 1.30pm: Kampung Raja mosque - Former prime minister Najib Abdul Razak denies he did nothing for the Orang Asli community during his premiership, as alleged by DAP supremo Lim Kit Siang. “That is not true. 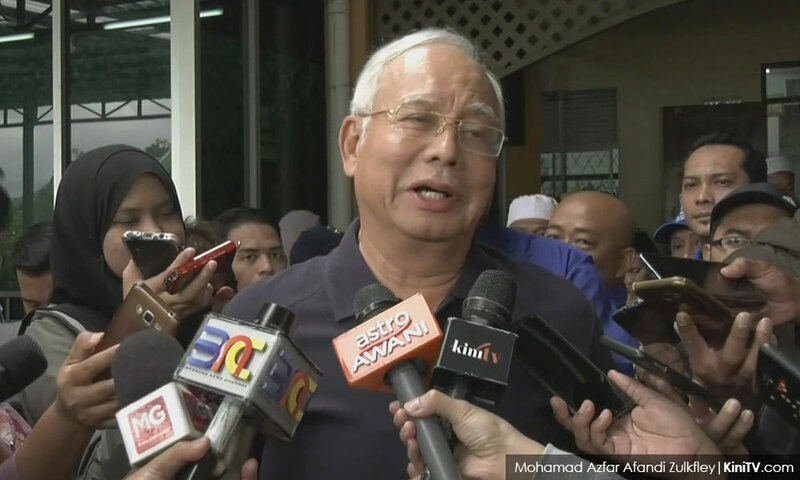 I always defend the Orang Asli, (we had) a lot of programmes but because they are spread so widely, so to place them all would take a long time,” Najib tells reporters. The last time he was here, he says, was in 2016 to officiate the launching of the Orang Asli settlement at Sungai Ruil, which was built by the BN government after the 2011 landslide tragedy in that area. He adds that land issues are more prominent in Cameron Highlands and it is the state government who can resolve those issues, not the federal government. Pahang state is currently administered by BN. 1.05pm - Felda Sg Koyan 3 operations centre: DAP secretary-general Lim Guan Eng questions why Pahang Menteri Besar Wan Rosdy Wan Ismail has not developed Jelai, the state constituency under his purview. 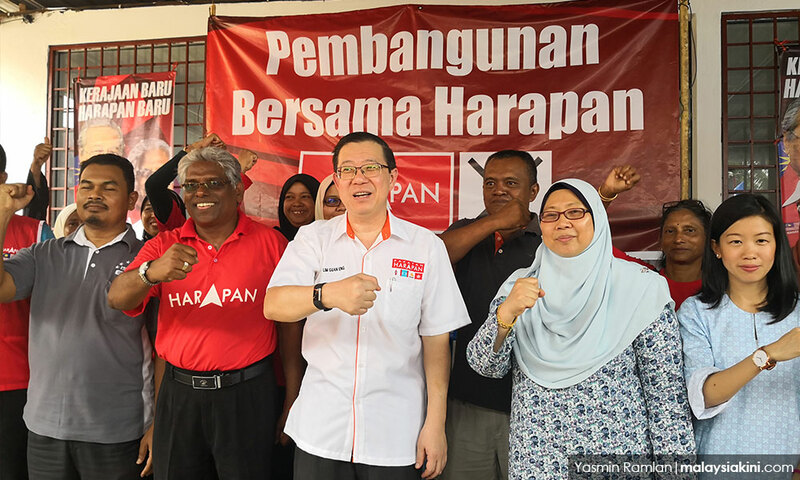 Lim also says that Harapan can develop the Cameron Highlands parliamentary constituency as a whole if its candidate M Manogaran wins the upcoming by-election. “Jelai is the Pahang MB’s area. Surely the MB will take care of this place. Why hasn’t he developed Jelai, Cameron Highlands and (Felda Sungai) Koyan?” he asks. Lim is speaking while launching the “Development Programme with Pakatan Harapan” together with Kuantan MP and Deputy Minister in the Prime Minister’s Department Fuziah Salleh. 1.05pm - Felda Sg Koyan 3 operations centre: Prime Minister Dr Mahathir Mohamad and Deputy Prime Minister Dr Wan Azizah Wan Ismail will be present in Jelai to give their support to Pakatan Harapan candidate for the Cameron Highlands by-election, M Manogaran. According to Deputy Minister in the Prime Minister’s Department Fuziah Salleh, Harapan’s machinery will be focusing on the BN state constituency, which is currently represented by Pahang Menteri Besar Wan Rosdy Wan Ismail. Wan Azizah will be in Jelai on Jan 23, while Mahathir will arrive a day before the by-election itself on Jan 25. 1.00pm: Tanah Rata - Pahang Menteri Besar Wan Rosdy Wan Ismail (picture, above) assures farmers in Cameron Highlands that they need not fear the state government will confiscating land which they have been managing under temporary operating licenses (TOL). Wan Rosdy, when met by media at the Umno Tanah Rata building, says that the state government is trying to speed up the process of renewing TOL land. “What is important is that the state government will not confiscate the land,” he says. When asked whether the period of use for TOL land would be extended to 30 years, Wan Rosdy says the state government will consider all provided proposals. “If it’s good, we’ll go ahead. No problem. If it’s for the benefit of the farmers, we will consider it,” he says. 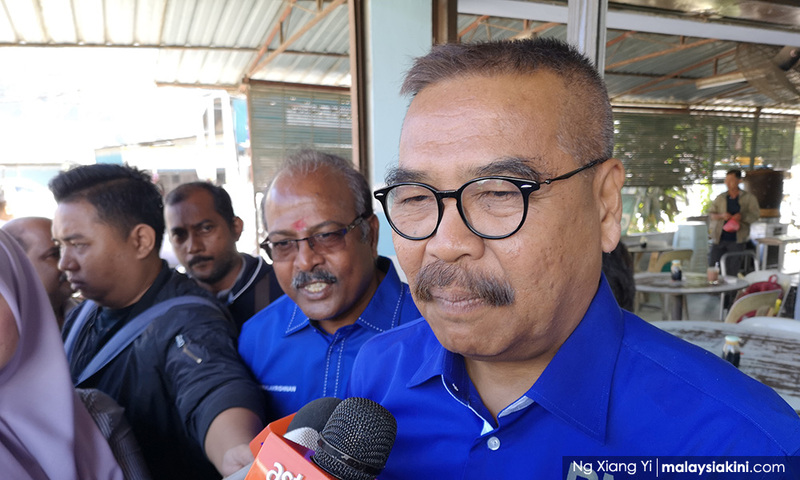 Wan Rosdy is also serving as BN’s director for the Cameron Highlands by-election and is scheduled to meet BN machinery after speaking to the media. 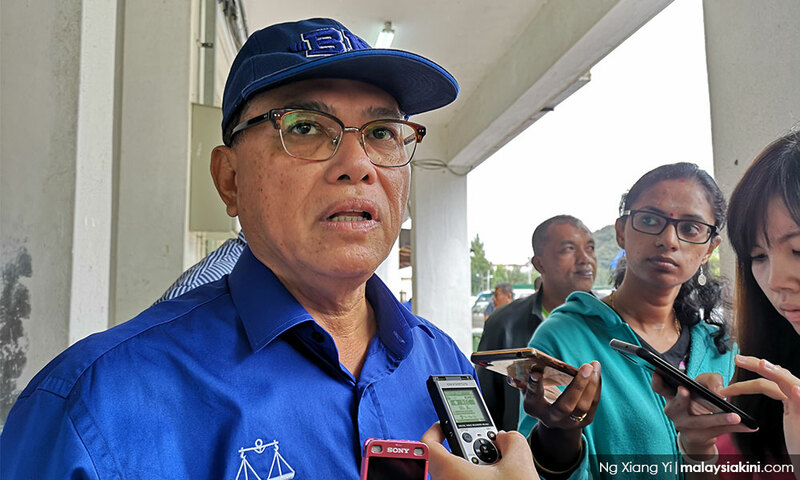 1pm: Kampung Raja Mosque - BN candidate Ramli Mohd Nor denies speculation that he may jump from BN if he wins the Cameron Highlands by-election. “My response is simple. BN is in my heart (BN di hatiku). “In our fight, we must have sincerity, honesty and integrity. That is all,” he says to reporters. Malaysiakini earlier reported that a highly ranked BN source believed Ramli may join the ruling coalition if he wins the Cameron Highlands by-election on Jan 26. This is a concern shared by BN grassroots in Cameron Highlands, the source said, as Ramli is not a member of any party. He is contesting as a BN direct candidate.